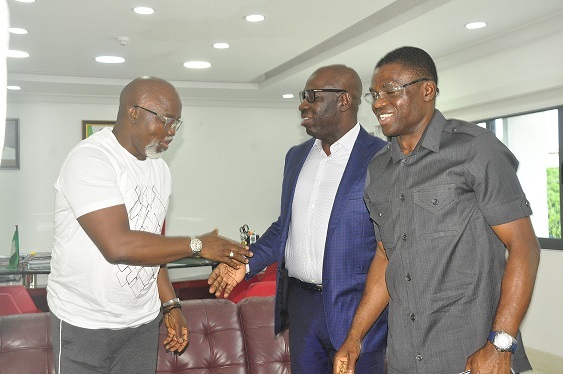 The newly elected President of the Nigeria Football Federation (NFF), Amaju Pinnick has commended Edo State Governor, Mr. Godwin Obaseki, for his initiatives in transforming the sports sector in the state. This comes as Governor Obaseki has appointed Godwin Dudu Orume to act as the interim Chairman of the Edo State Sports Commission, pending ratification by the Edo State House of Assembly (EDHA). 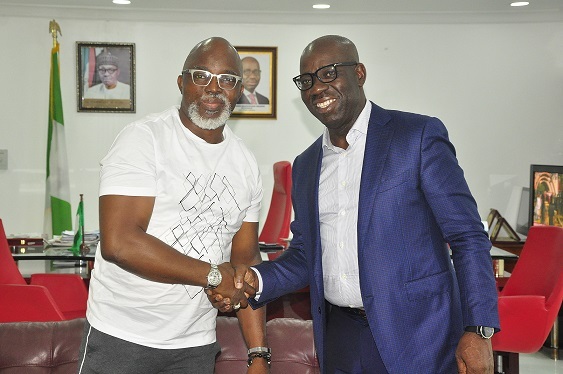 Pinnick relayed his gratitude during a courtesy visit to the governor at the Government House in Benin City, Edo State, at the weekend. The new NFF helmsman commended Obaseki’s administration for transforming the sports sector in the state, noting governor’s efforts would help in reclaiming the state’s stature as a destination for sporting activities in Nigeria. Pinnick said he was in the state to appreciate Governor Obaseki and his deputy, Rt, Hon Philip Shaibu for their support in his re-election bid as President of NFF. “I am very grateful to Governor Obaseki, who played a major role and gave me all the needed support that led to my emergence as winner in the election held in Kastina State. The poll was supervised by officials of the Federation of International Football Association (FIFA),” he said. He assured Governor Obaseki and his Deputy that, if the contractors handling the Samuel Ogbemudia Stadium facelift delivers a good job, he will ensure that the Super Eagles play in the stadium in April, 2019. Congratulating Pinnick on his re-election, Governor Obaseki extolled his leadership style, assuring that the Samuel Ogbemudia Stadium will be ready by January 2019, for the use by the national team. Obaseki said the newly Godwin Dudu Orume has been appointed interim Chairman of the newly established Edo State Sports Commission. His said his administration will do everything possible to ensure that the state reclaim its pride in sports as it was when it was Bendel State. Deputy Governor, Rt. Hon. Shaibu commended Pinnick, assuring him continuous support of Edo State Government to ensure he succeeds in his second term in office as NFF President. Edo State Governor, Mr. Godwin Obaseki (right); President of the Nigeria Football Federation (NFF), Amaju Pinnick, during Pinnick’s courtesy visit to the governor at the Government House in Benin City, Edo State.